WASHINGTON (Reuters) - New World Bank President David Malpass said on Tuesday he would not alter the lender's commitment to fight climate change, but pledged to step up its anti-poverty mission and to evolve the bank's relationship with China. Malpass, who started at the Bank on Tuesday, was nominated by U.S. President Donald Trump. Some development professionals feared that he would pursue Trump's "America First" agenda at the bank by resuming financing for coal power projects and pressuring China. But Malpass told reporters that he will pursue the World Bank's climate change goals, including its previous decision to withdraw from coal power funding. He called climate change a "key problem" facing many of the world's developing countries. A long-time finance executive, economist and government development official, Malpass most recently served as the U.S. Treasury's undersecretary for international affairs. He helped negotiate a $13 billion capital increase for the World Bank last year. That refunding included requirements that the bank shift lending away from middle-income countries including China towards lower-income countries. Malpass at the time was highly critical of China's continued borrowing from the World Bank and of Beijing's Belt and Road initiative. But he said on Tuesday that new lending to Chinese projects was already declining and the relationship would shift towards one of increased contributions to the bank and sharing of expertise. "That means an evolution where they are much less of a borrower, and they have more to offer in terms of their participation in capital increases, their participation in IDA, where China has been ramping up its contributions," he said, referring to the International Development Association, the World Bank's fund for the poorest countries. His view on China contrasted those of U.S. Treasury Secretary Steven Mnuchin, who told lawmakers that Malpass' presence at the World Bank would help the United States compete with China's Belt and Road initiative. That program entails hundreds of billions of dollars in infrastructure development and investment by China in about 65 countries with an emphasis on transportation routes. Asked at a House Financial Services Committee hearing on Tuesday what the United States could do to "push back" on China's growing presence in international development, Mnuchin replied, "I think the single best thing is that David Malpass, who was my undersecretary, is now head of the World Bank." The World Bank, combined with a new U.S. development agency created by Congress last year, "can be a serious competitor to their Belt and Road," Mnuchin added. The United States remains the World Bank's largest shareholder, and the Treasury oversees the U.S. interests at the institution. 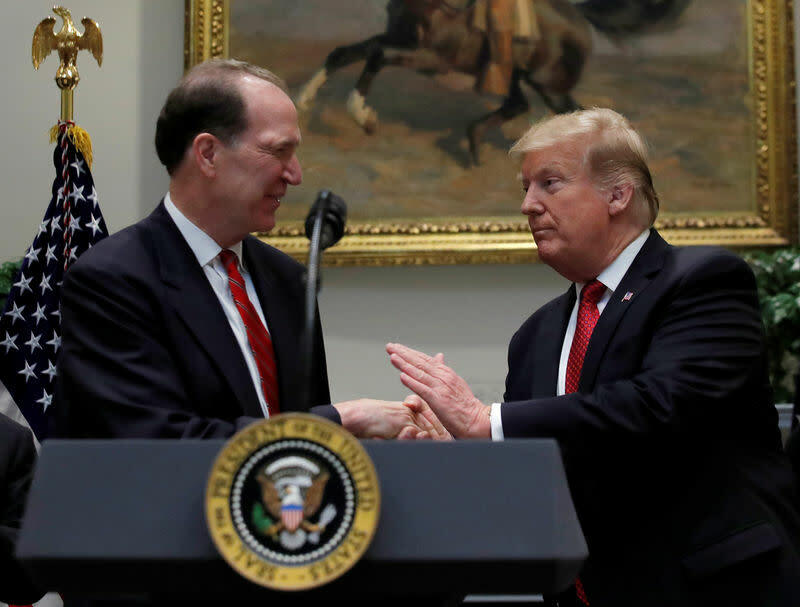 Malpass said he saw no need for a restructuring of the World Bank's operations, but he would seek to make lending more effective at lifting people out of poverty.